Bħalissa qed nagħmlu l-verbi. 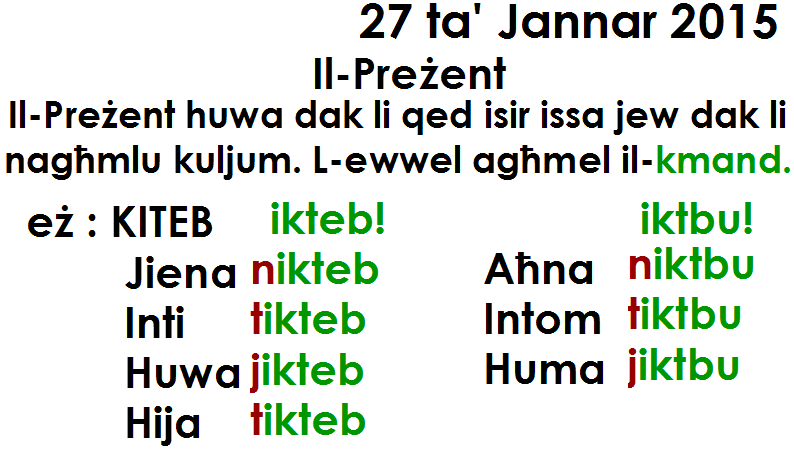 Importanti li t-tfal ma jħalltux il-preżent mal-passat. Dan kollu jiġi bil-prattika meta jħaddmu Malti tajjeb. Skużawni ma tantx qed ikolli ċans intella' affarjiet fuq il-blogg, imma bħalissa ninsab mingħajr internet fil-klassi. VERY IMPORTANT NOTICE :Study Your Tables. In year 3, children will learn the tables of 2, 3, 4, 5, 10. You have all the notes on the maths study copybook. Here is the song we are using in class. You will also need to know counting in twos, threes, fours, fives, tens. For example : Counting in threes 3,6,9,12,15,18,21,24,27,30,33,36 and backwards.